Utilities: Tenant is responsible for power & gas. Landscape: Tenants are responsible for regular lawn maintenance. 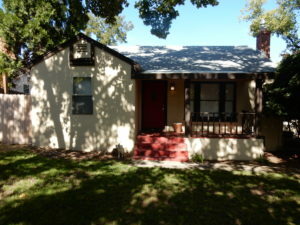 Great location in Fair Oaks, this house is on Fair Oaks Blvd between Winding Way & Sunrise Blvd. Lots of actives around this property with the close proximity to the American River, great shopping, entertaining and dinning very close. This charming home is on a large lot over 1/3 of a acre with lots of room for friends and family entertainment and storage in the backlot that can hold a RV or storage for your boat or extra vehicle. As you enter this home you are greeted with original hard wood flooring throughout, a cozy family room with a gas fireplace with windows that open up to the spacious front yard and covered front porch patio. Off the family room is a kitchen nook area and spacious kitchen. There are two bedrooms and a full bathroom to the left side of the house and the 3rd bedroom is to the far right of the house above the garage, a large spacious bedroom with its own full bathroom. The large private backyard has a large back deck, garden area if you would like to plant your own vegetables and a fence that separates the backyard from the back lot that you have access to as well for boat or RV storage.